Home » Politics » Dinakaran bows out, paves way for AIADMK merger. Is this end of Sasikala? AIADMK merger on the cards. Did Sasikala & Dinakaran overplay their hand? With his erstwhile followers threatening to desert him, AIADMK Amma general secretary TTV Dinakaran on Wednesday decided to bow out and pave the way for the merger of his faction with that of his rival O Panneerselvam. Terming the sudden rebellion by his partymen as a decision born out of fear, Dinakaran told reporters “they developed cold feet in the last few days”. This seems to have in reference to the cancellation of the RK Nagar by-election after I-T raids on a minister. He said they need not have gone public with their revolt against him and said “ Had they asked me, I would have resigned”. 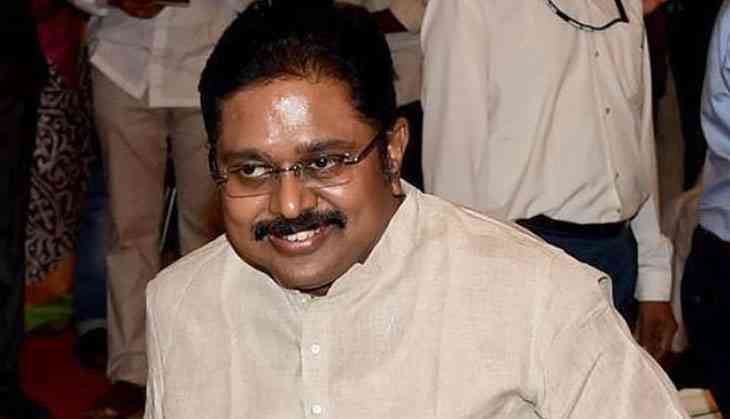 The decision followed a meeting last Friday, in which senior ministers told Dinakaran that they would be forced to sideline him if he did not withdraw from party affairs on his own. Getting a green signal from Panneerselvam that he was ready for a merger provided Dinakaran and his jailed aunt Sasikala were kept out of the party, chief minister Edappadi Palaniswami went into a huddle with senior cabinet colleagues and they decided to accept the demand. Finance Minister D Jayakumar announced late last night the decision to dump Dinakaran and Sasikala. He said this was the unanimous view of not only ministers, MLAs and MPs but also the party rank and file . Mr Jayakumar said that a committee would be formed to work out the modalities for the merger. However, a handful of MLAs, including prominent former minister Thanga Tamizh Selvan told reporters that general secretary and deputy could not be removed from the party by ministers, but only by a properly convened meeting of the party’s decision-making bodies like the executive or the general council. The Palanisamy government propped up by Dinakaran so far, has a tenuous majority with 122 MLAs in a Assembly of 234 members. In the trust vote last February, the government won by 122 votes against 11 by the OPS camp. Therefore, to pull down the government, Dinakaran needs the support of over 20 members whereas only a handful have come out in his support so far. Realising that the game was up, Dinakaran decided to gracefully quit instead of going for a showdown. Meanwhile Panneerselvam has called a meeting of MLAs on Thursday to work out the plan of action. The Edappadi faction's desertion of Dinakaran was a major victory for Panneerselvam, who revolted against the Sasikala clan in February. The revolt followed Sasikala’s attempt to grab power after Chief Minister J Jayalalithaa’s passing, by assuming the post of interim general secretary, a post that has not been provided for in the party constitution. Despite managing to get a majority of MLAs and MPs to rally behind her, Sasikala failed in her attempt following her conviction by the Supreme Court in the assets case. Before going to serve time in Bengaluru jail, she appointed her nephew TTV Dinakaran as her deputy, another created post. Following her imprisonment, her loyalists elected Edappadi Palaniswami as Chief Minister. Eager to take over from Edappadi as soon possible, Dinakaran threw his hat in the ring in the RK Nagar by-election. He splurged money in the constituency and even deployed ministers, some of whom got embroiled in the cash-for-vote sam. The tax raids on Health Minister Vijayabhaskar threw up evidence that Dinakaran planned to spend Rs 89 crore to secure his win and this led to the cancellation of the election itself. From then on, his slide was rapid. Seeing the writing on the wall, ministers wanted to distance themselves from Dinakaran. The initiative to oust Dinakaran and work for the merger of the two factions was taken by Lok Sabha Deputy Speaker M Thambidurai . Events moved at a rapid pace after the Delhi Police registered a case against Dinakaran on the basis of information that he planned to bribe Election Commission officials to get the 'two leaves' symbol which was frozen after the split in the party. While the Edappadi faction offered to merge with the OPS camp, Panneerselvam said that this would be possible only if Sasikala and Dinakaran were removed from the party. Taken aback by this demand, the ministers went into a huddle. Instead of sailing or sinking with Dinakaran, the Edappadi camp decided to desert him to save the government and the party. The rebels came out in the open when Dinakaran was away in Bengaluru to meet Sasikala and discuss the issue. Upon his return to Chennai, he announced his decision to bow out. As an overwhelming section of the party has revolted against him, Dinakaran was left with no option but to fade away. Sasikala cited the same reason that dual authority would lead to friction and used it as a reason to ease out Panneerselvam as CM. She would have got away but for the Supreme Court verdict. The committee set up to work out the merger formalities will have to grapple with the question whether the present government will continue or whether Panneerselvam will lead again on the grounds that he was a victim of Sasikala's machinations. It will also have to decide who should be general secretary and whether his role vis --vis the Chief Minister should be redefined. Governor Ch Vidyasagar Rao, who has returned to Chennai from Mumbai, may again have to play a role in ensuring smooth governance in the days to come. Only after the merger formalities are completed, can the two factions can approach the EC to unfreeze the symbol.